First visuals have now been revealed by Duchy Homes for its new development in Hessle, East Yorkshire. 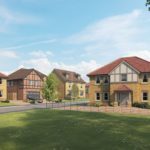 It has recently been revealed that the new development, named Roseberry Park, will include a combination of house designs featuring a mix of three-, four- and five-bedroom bungalows and houses, as well as two-bedroom affordable bungalows being delivered for the East Riding of Yorkshire Council. Situated on Ferriby Road at the start of the Yorkshire Wolds Way, the former Bridgeview School site is currently under construction. The development will retain the existing hedgerow, verge and tree line frontage, which is a key characteristic of the neighbourhood. A new area of on-site managed open space will be provided by Duchy Homes for the local community.